Wally and Mikaela amongst the snow ghosts on Le Moucherotte. 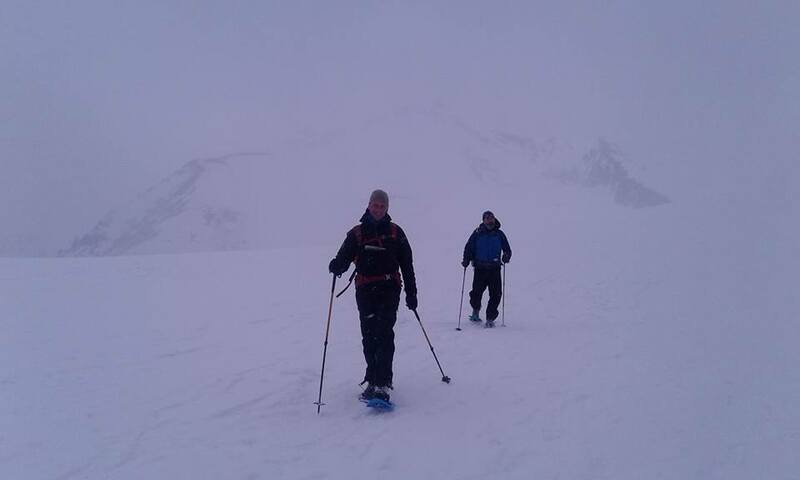 Lucy: Its exactly a week since I joined Wally in Le Bourg d'Oisans, where we are spending the winter season. Life is a bit different here to the one I'm used to back home on Arran. It's bitterly cold outside, (rather than damp), and everything is covered in snow. Everything! Great early season conditions here in the Alps mean that the mountains are in excellent condition for snowshoeing, yet at the same time, the avalanche hazard is considerable or higher. My job this winter is to build up my experience and fill my logbook as I work my way along the IML qualification pathway. I've hit the ground snowshoeing, literally, and already enjoyed some quality days in the mountains. Here are a few pics from the week which I hope you enjoy. Mikaela in the forest at Chamrousse. On Monday, Wally and I met with Mikaela Toczek, who is based near Grenoble and on a similar mission to me. 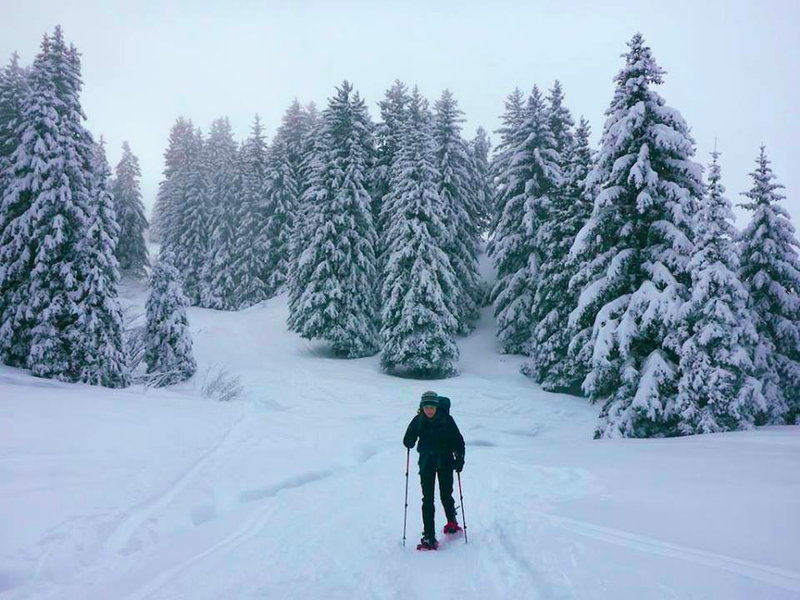 We headed in to the Vercors Massif, with snow falling all around us, and bagged Le Moucherotte, a small summit overlooking Grenoble. Conditions felt distinctly Scottish, with a cold breeze and rime ice all over everything. Roosting "igloo", probably for Black Grouse. On Wednesday, the avalanche hazard went through the roof, with a cold northerly wind shifting the powdery snow around, so Mikaela and I headed to the forest behind the ski area at Chamrousse. There were lots of signs of nature around for us to enjoy without sticking our necks out to much. We enjoyed discovering fox tracks, mountain hare, and the roosting burrows of black grouse amongst the trees. Yesterday was the shortest day of the year, a time that back home on Arran, is invariably dark and damp. My normal response is to enjoy cups of tea and cake by the fire, but yesterday I joined my new snowshoe buddy Kirsten for an exploration of the plateau and ridges above Les Signaruax. We were treated to a magical display of winter light as we emerged through a cloud inversion and in to the sunshine. I can safely say that this is the first time that I have been sunburned on the winter soltice! Kirsten on the plateau above Les Signaraux. Lucy: I'm back on Arran after a couple of weeks living the high life in the Haute Savoie. This was a personal trip, preparation for my International Mountain Leader Summer Assessment, followed by the assessment itself, which I'm delighted to say, I passed. Based in Samoëns, I had 10 days to get to know the area, before assessment, trekking up high, exploring the passes and steeper chained sections of the main routes, and learning about the amazing biodiversity of the area. The backdrop was an incredible karst limestone landscape, baking sunshine, lively marmots and badass alpine flowers throwing shades at 2500m. Guidebook: Cicerone's Walking in the Haute Savoie: South. Now all that remains is the (not) small matter of my Winter Assessment! Massive thanks to the posse of aspirant IMLs and other warm and friendly folk who I joined in the hills, to the Plas Y Brenin staff for a professional and challenging assessment, and Ian Spare, Communications Director of BAIML for organising an aspirants day in the hills. On the way up to the Refuge Alfred Wills. Cascade de la Pleureuse, Sixt fer a Cheval. 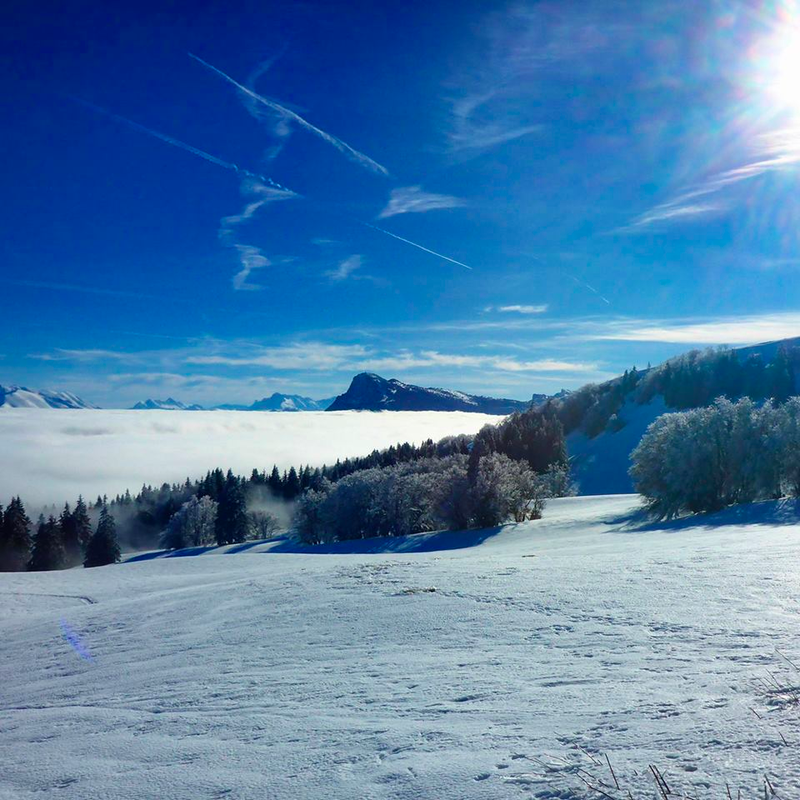 Lucy writes: I'm just back from a magical week in the French Alps on an International Mountain Leader award winter training course based in Le Grand Bornand with Plas Y Brenin. During the week we encountered varied snow conditions, from hard old snow to epic amounts of fresh that fell towards the end of the week. 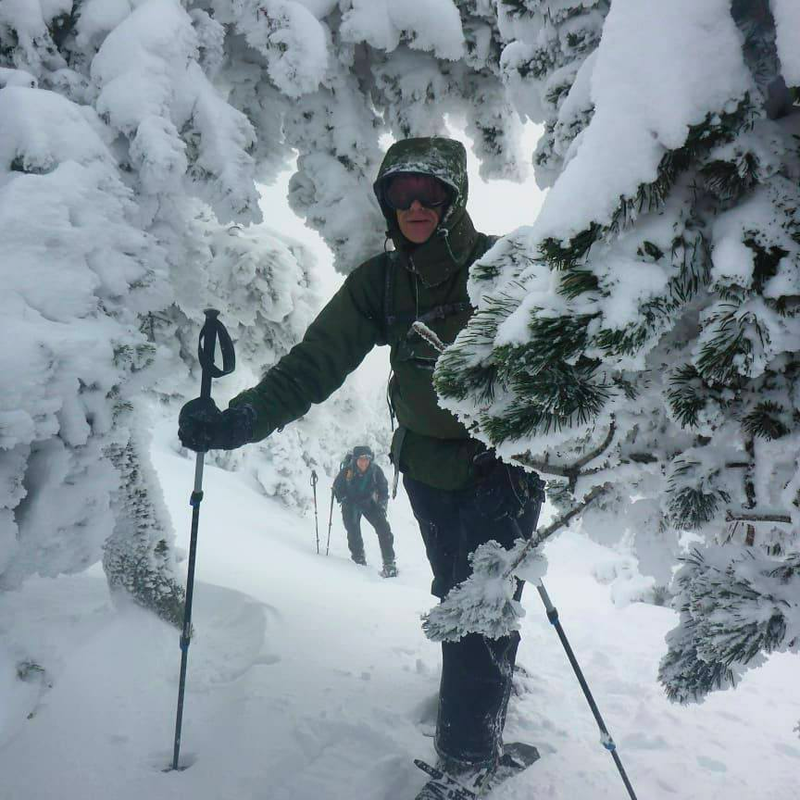 We covered all aspects of safe travel, including avalanche and snowpack awareness, terrain, weather and route choice. 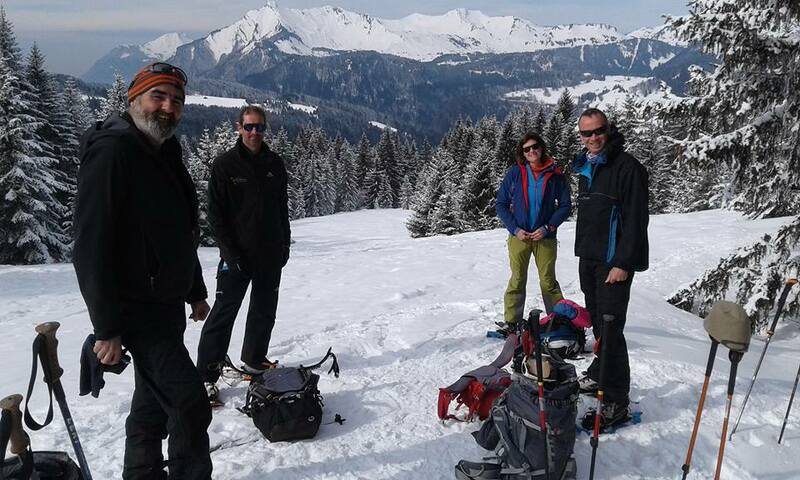 There was lots of learning anf fun adventures on Snowshoes around our base at Le Grand Bornand. After the course finished I spent a couple of days with some of the others from the course exploring on snowshoes and putting our new skills in to practice.